Yesterday I experienced a sudden moment of health consciousness. I’m overweight and under-exercised. I find every excuse in the book to remain at home and do ‘inside things’. Instead of going outside I worked on an upcoming blog series and tinkered around with a 1948 Ford radio that I am trying to resurrect for a friend. My intelligent and beautiful wife went off to the gym. I should have followed but did not. Then the weather changed. It shot up to 55 degrees yesterday. That’s rather warm for a winter day in New England.What to do next? Hang around and finish off the M&M’s? I made the decision in a flash. Take a walk! I quickly suited up (hoodie covered by a light jacket), attached a cell phone to my belt and put a camera in my pocket. The note I left on the counter for my wife said “I went for a walk. I have my phone. Love, Ken”. The Boy Scouts taught me well: “Always register with the mountain trail rescue staff before taking a hike.” Okay, so it was just going to be a two-mile round trip on level country roads; at my age you don’t take chances. My biggest problem with exercise is that I get bored easily. Every walk has to be in a different direction. I need to liven things up with a new GPS program, an active search for old hubcaps, or taking photographs. The camera was good enough for this short outing. I present here a few of the photos I took. You will notice that our neighborhood is a bit scruffy during the winter. There is an excess of gray dirt, gray trees, dull mailboxes, and invading bull briers. Thankfully the groundhog did not see his shadow today so that means we can expect an early spring. 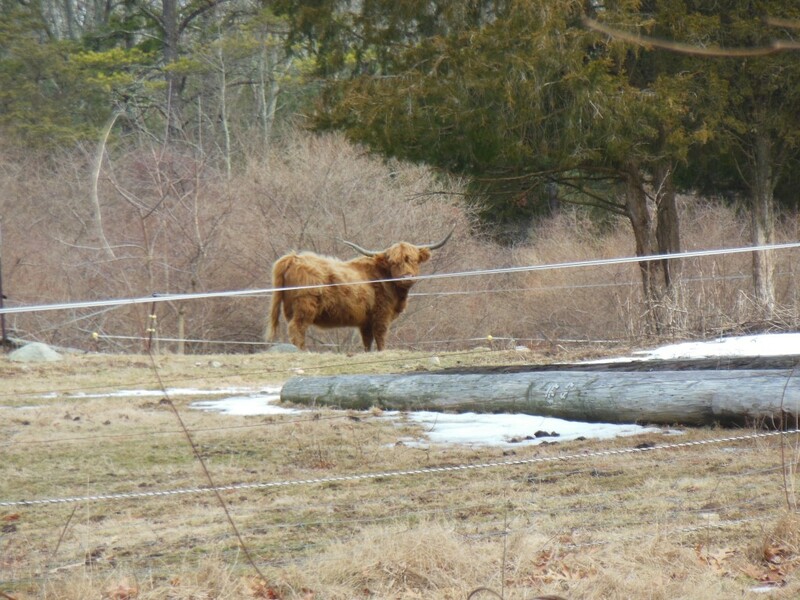 One of our neighbors keeps Highland Cattle. They like to stare at me. Although they are said to be gentle beasts, I am grateful for the fence that contains them. They are beautiful animals. I usually stand for several minutes staring back at them. Clicking on the photo will bring you to a site dedicated to people who enjoy raising these imports form Scotland. Do they have Bop the Mailbox competitions where you live? It’s a great sport that is practiced primarily by teenagers who have about as much imagination, creativity, and pride as an old bottle cap. 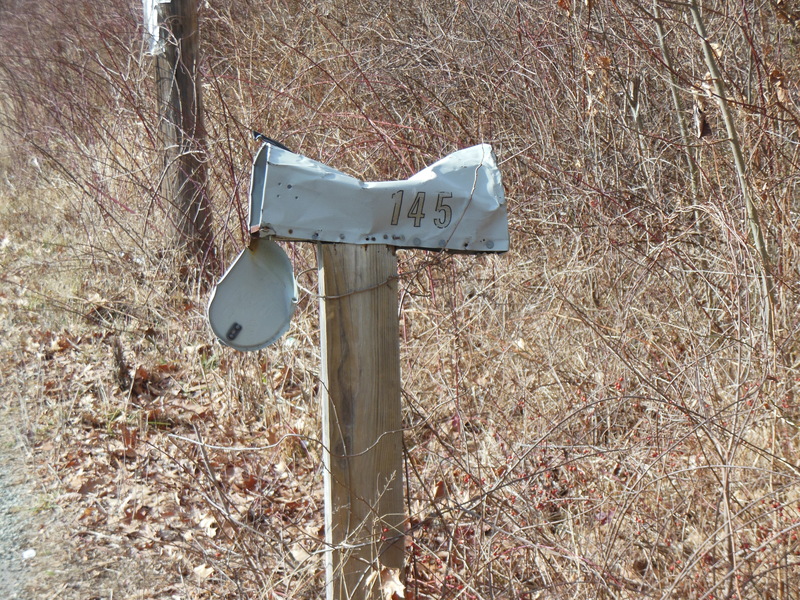 Some people repair the mailbox after it has suffered one or two rounds of match play. Others don’t. I think this tree is making a plea to heaven: “Please take me to the great forest in the sky.” It’s limbs have been rotting and falling for decades, cuttings of hurricane-damaged saplings surround it and the brambles are closing in. Our town, like many in New England, used to have a couple of town pounds. They usually consisted of an enclosure with a brook running through them. Stray domestic animals were kept there until the owners paid a fee and picked them up. 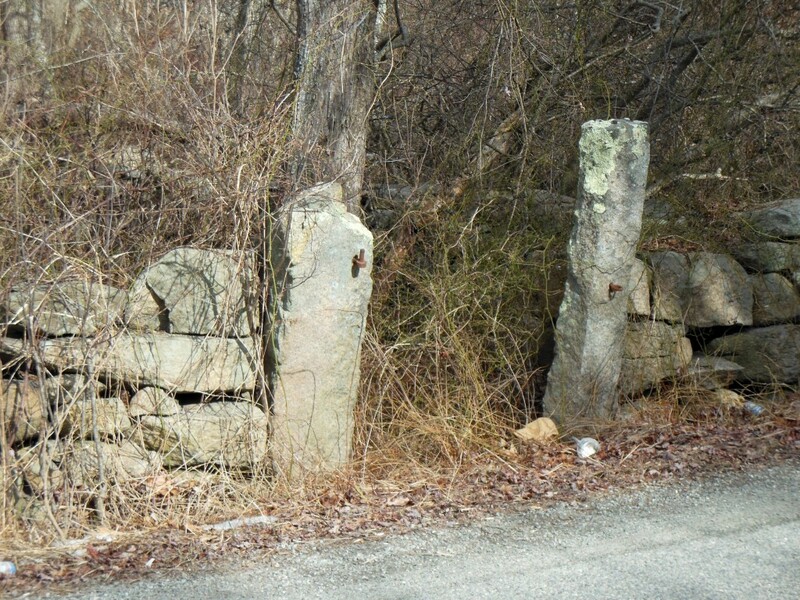 These granite posts would have supported an iron gate at one time. If this was on my property I would clean out all the bull briers and small trees. History should not be neglected. 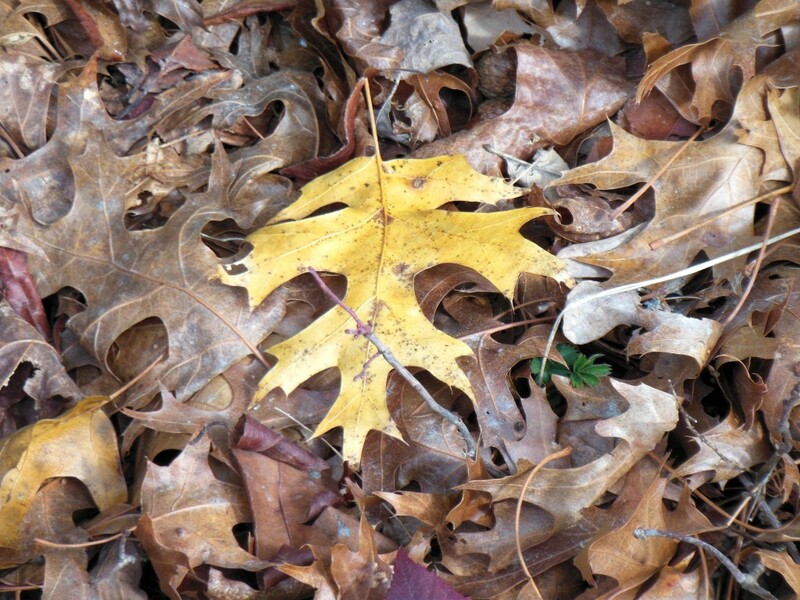 There are several plants species represented in this fall debris but oak is the dominant one. I look down a lot because that is where you find all the neat things like old signs, broken telephones, and hubcaps. 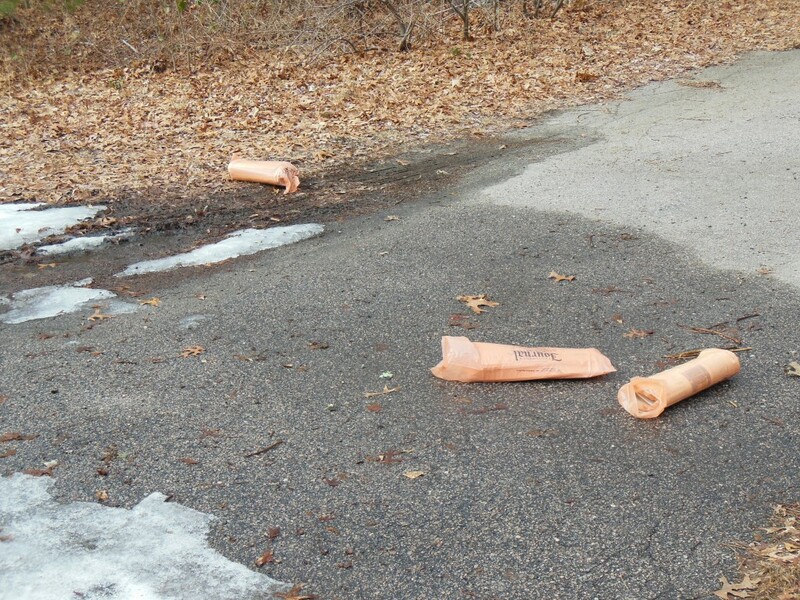 I really should take a garbage bag with me next time. It would be a cinch to fill it with Budweiser cans and those small liquor bottles they used to serve on airplanes. 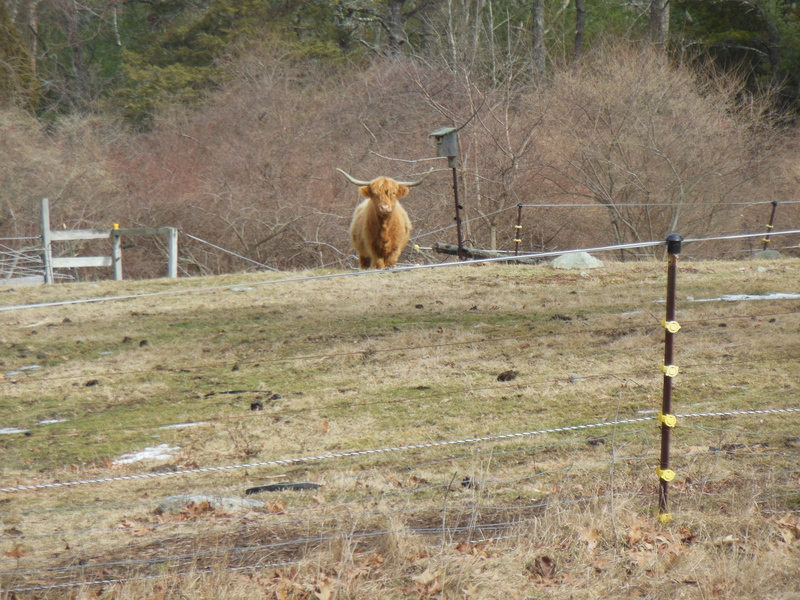 After walking about a mile (and removing my jacket and hoodie – it was getting hot) I passed by my cattle friends again. This time one of them began to approach the fence. This is as close as he would go, though. They have incredible curiosity. Are all cattle like this or just these shaggy mountain dwellers? 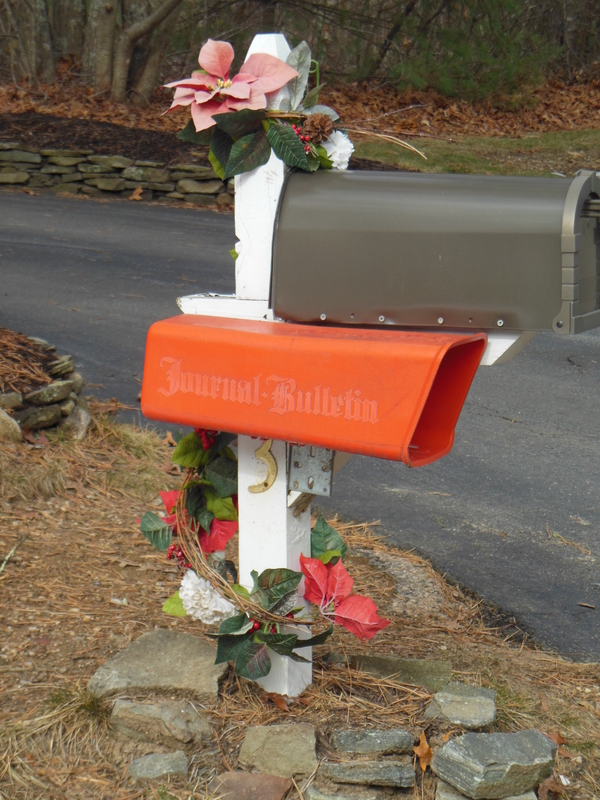 Many years ago I subscribed to the Providence Journal Bulletin, the only RI newspaper that is not a one-community paper. They used to pile up inside my home because I never seemed to have enough time to read them. These days I get most of my news from the radio, TV, and Internet. A newspaper is better but I know what would happen to it if I subscribed again. Apparently these people are on vacation or they don’t read as much as they think they do. Flowers that bloom in the winter. You should see the other side. It’s even more colorful. This family keeps a nice place and reminds us that spring is coming. Their newspaper goes in the red box. So, are you inspired to take a walk in your neighborhood now? Take your camera. The photos are waiting for you to take them. 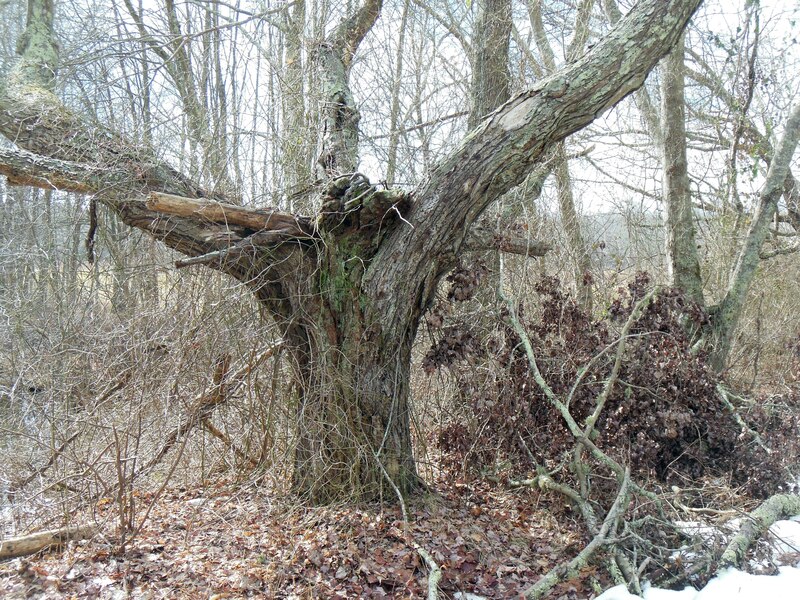 This entry was posted in Nature: Plants and Animals, Backyard, Woods, and River, Occasional Commentary and tagged "New England", nature, Rhode Island, RI, Scotland, walking. Bookmark the permalink. Ricky, although you are correct I’m sure you also recall that consent must be given in person while drinking a beer. Let me know when you two are in the area. I will have the beer ready.